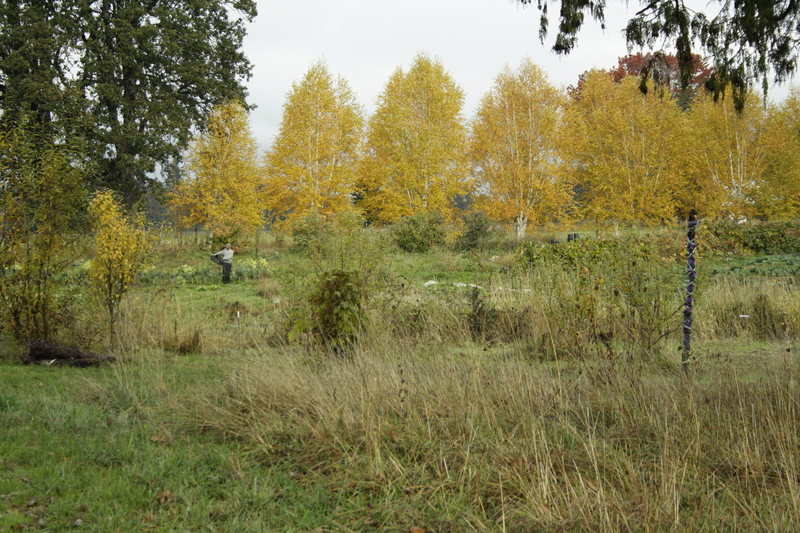 All around the farm, the golden brown of autumn surrounds us. Summer plants have died and are in various states of decay, the leaves are well on their way, shouting out in bright yellow before falling quiety to the ground. Always on this farm, we live up close and personal with this cycle–the cycle of the seasons: growth, death, decay, re-birth. That this cycle is matter of fact, that it applies to all that lives and breathes this fine air of life, this truth permeates, so to speak. The more shocking truth that we have come to know as we spend time out here is that everything we are engaged in at one time on the farm is also always playing itself out on the other end of the spectrum too, at the same time. We are in a constant state of duality. 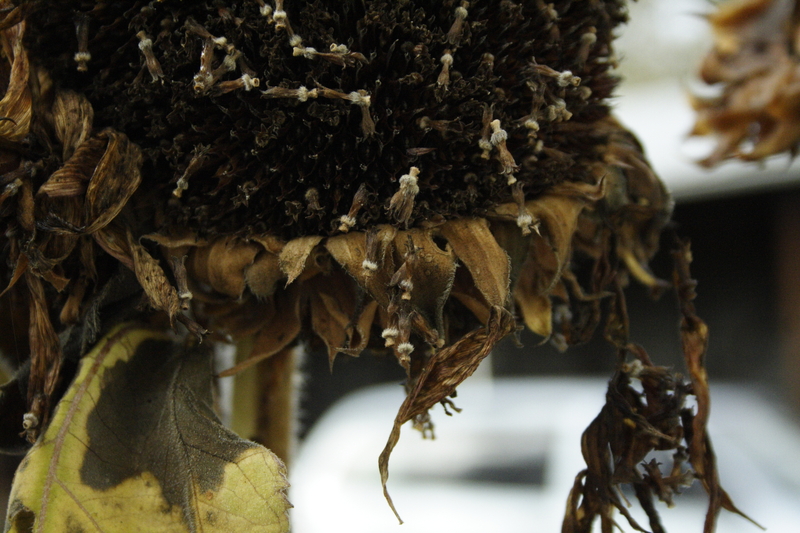 Life and death, or death and life as it is at this time of year…ever present, side by side. Just as the summer crops turn to mush and the leaves crinkle and dry up, there is an explosion of green in the fields. So much green, much like in the spring, only darker and sturdier are the leaves, full of the promise to feed us through the cold. 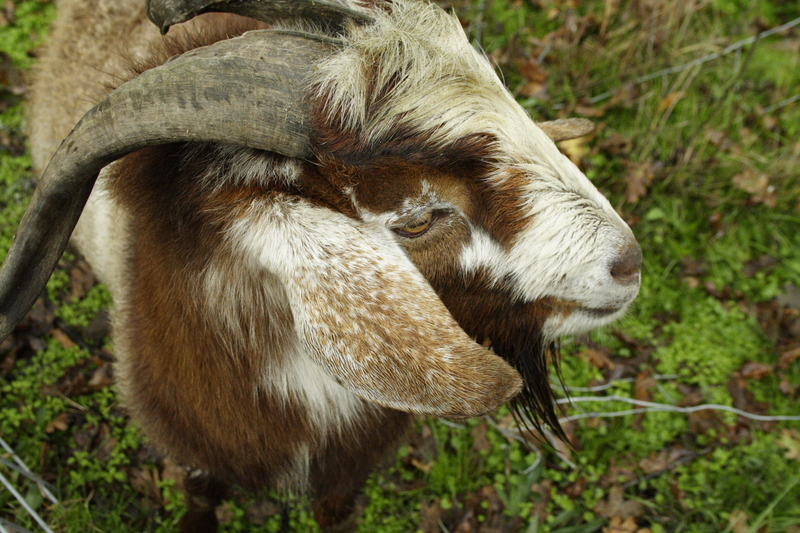 The brown billy goat smells up the farm with his inate drive to make life now, just as so much around him dies away. Next spring, those baby goats will liven up this place, just as the tender and bright green shoots of spring brighten the bleak landscape of winter once more. And in spring, while all that life is exploding, we will be planting and planning for the coming winter again, sowing crops for harvest half a year away. When my parents passed away, I found this all so comforting. In an abstract way, it really is. It does allow one to feel connected, even in death, to something grand and beautiful in design. Still, this fall I can’t help but feel a distinct separateness from this. Human tragedy seems to superceed this design. Is there comfort to be found in knowing life goes on with or without us, with or without our hopes and dreams? I don’t know. In the face of inexplicable human sorrow, where do we search for meaning? Fall is the great time of turning inward. The spark of thoughts germinating inside as we lived more loudly through summer are finally given air. There is so much this month for my family to be thankful for, this farm and our lives are so truly blessed. Yet, at the same time we are faced with loss and deep wells of compassion for our friend’s and loved ones we know who have suffered unbearable losses in this life. This duality is so confusing, and yet, in the day to day workings around here, we work and play as ever we did. Like the earth that forever puts forth both the blossoms of life as well as the blankets of dying leaves, we live both sides of the coin simultaneously. The deepest joys coupled with the deepest pains; we feel them, let them shine or burn the center momentarily depending, but mostly let them lie on the periphery while we continue with the day to day. Such mysteries I can not understand on this beautiful fall morning! All I know is that wherever we are on our paths today, most of us have only things to be thankful for. Let us not give weight to the small things–the intermitent pests on the crops, the unpredictable weather, the hard day; these things matter little in the grand scheme. My own personal harvest is so bountiful and beautiful, there has been no great suffering. Why? How? I can’t say, but it is selfish to do anything else but feel those blessings and let go of the rest. I am saving my worry for others. Autumn. Yep. Well put, Boodle.